Lotte Motz, née Edlis was born in Vienna in 1922 She was a Jew who escaped to the United States in 1941. She obtained her Phd in German and philology in 1955 at the University of Wisconsin, Madison and moved to Oxford in 1959. In 1971, she returned to America and gained an appointment in the German Department at Brooklyn College, City University of New York. Illness forced her to return to Oxford and abandon her successful teaching career. Lotte Motz's field of work was originally Icelandic and Germanic Mythology and Religion. She wrote four books and well over 50 articles related to Northern Mythology. Lotte Motz was a passionate seeker of truth and justice. Quite possibly her greatest strength as a scholar was that she was never afraid to attack the icons of scholarship if she felt the truth lies elsewhere, being the very first scholar to challenge the truth behind the goddess Nerthus in Tacitus Germania. Her popularity as a speaker always filled lecture halls wherever she read. She was both witty and enthusiastic and projected her insights to her audience always with great passion and conviction. She leaves a daughter Anna and a grand-daughter Hanna. Lotte Motz was thus the first scholar in recent history to question the truth behind the goddess Nerthus in Tacitus' Germania, the name being only one of several possible manuscript readings, thus opening up new paths of thought on early Germanic religion. Lotte Motz was certainly the first scholar in our field to take a serious step past the Three-Function-Theory developed by Georges Dumezil nearly four decades ago. 1) 1973a. "New Thoughts on Dwarf-Names in Old Icelandic", Frühmittelalterliche Studien 7:100-117. 2) 1973b. "Withdrawal and Return: A Ritual Pattern in the Grettis Saga", Arkiv för nordisk filologi 88:91-110. 3) 1973/1974. "Of Elves and Dwarfs", Arv 29/30:93-127. 4) 1975. "The King and the Goddess: An Interpretation of Svipdagsmal", Arkiv för nordisk filologi 90:133-150. 5) 1976. "Burg-Berg, Burrow-Barrow", Indogermanische Forschungen 81:204-220. 6) 1977. "The Craftsman in the Mound", Folklore 88:46-60. 7) 1979. Driving Out the Elves: A Euphemism and a Theme of Folklore", Frühmittelalterliche Studien 13:439-441. 8) 1979-1980. "The Rulers of The Mountain: A Study of the Giants of the Old Icelandic Texts", Mankind Quarterly 20: 393-416. 9) 1980a. "Old Icelandic Völva: A New Derivation", Indogermanische Forschungen 85:196-206. 10) 1980b. "Sister in the Cave: The Stature and the Function of the Female Figures of the Eddas", Arkiv för nordisk filologi 95:168-182. 11) 1981a. "Gerðr: A New Interpretation of the Lay of Skirnir", Maal og Minne 121-136. 12) 1981b. "Giantesses and their Names", Frühmittelalterliche Studien 15:495-511. 13) 1982a. "Giants in Folklore and Mythology: A New Approach", Folklore 93:70–84. 14) 1982b. "Freyja, Anat, Ishtar and Inanna: Some Cross-Cultural Comparisons", Mankind Quarterly 23:195-212. 15) 1983. The Wise One of the Mountain: Form, Function and Significance of the Subterranean Smith: A Study in Folklore, Göppingen: Kümmerle. ISBN 3-87452-598-8. 16) 1984a. "Giants and Giantesses:A Study in Norse Mythology and Belief", Amsterdamer Beiträge zur älteran Germanistik 22:83-108. 17) 1984b. "Gods and Demons of the Wilderness: A Study in Norse Tradition", Arkiv för nordisk filologi 99:175-187. 18) 1984c. "The Winter Goddess: Percht, Holda and Related Figures", Folklore 95:151-166. 19) 1984d. "Trolls and the Æsir: Lexical Evidence concerning North Germanic Faith", Indogermanische Forschungen 89:179-195. 20) 1986. "New Thoughts on Volundarkviða", Saga-Book 22:50-68. 21) 1987a. "Old Icelandic Giants and their Names", Frühmittelalterliche Studien 21:295-317. 22) 1987b. "The Families of Giants", Arkiv för nordisk filologi 102:216–236. 23) 1988. "The Storm of Troll-Women", Maal og Minne 31-41. 24) 1991a. "The Cosmic Ash and other Trees of Germanic Myth", Arv 47:127-141. 25) 1991b. “The Poets and the Goddess,” in Preprints of the Eighth International Saga Conference: The Audience of the Sagas (Lars Lönnroth, ed. ), 2:127-33. 26) 1992. "The Goddess Nerthus: A New Approach", Amsterdamer Beiträge zur älteren Germanistik 36:1-19. 27) 1993a, The Beauty and the Hag: Female Figures of Germanic Faith and Myth. Wien: Fassbaender. ISBN 3-900538-40-9. 28) 1993b. "Gullveig's Ordeal: A New Interpretation.” Arkiv för nordisk filologi 108:80-92. 29) 1993c. "þorr's River Crossing", Saga-Book 23:469-487. 30) 1993d. "The Host of Dvalinn: Thoughts on Some Dwarf-Names in Old Icelandic.” Collegium Medievale 6:81-96. 31) 1994. "The Magician and His Craft." Collegium Medievale 7:5-31. 32) 1996a. The King, the Champion and the Sorcerer: A Study in Germanic Myth. Wien: Fassbaender. ISBN 3-900538-57-3. 33) 1996b. "Kingship and the Giants", Arkiv för nordisk filologi 111:73–88. 34) 1996c. "The Power of Speech: Eddic Poems and their Frames", Amsterdamer Beiträge zur älteren Germanistik 46:105-117. 35) 1997a. The Faces of the Goddess. New York & Oxford: Oxford University Press. ISBN 0-19-508967-7. 36) 1997b. "The Germanic Thunderweapon", Saga-Book 24:329-350. 37) 1998a. "The Sky God of the Indo-Europeans", Indogermanische Forschungen 103:28-39. 38) 1998b. "The Great Goddess of the North", Arkiv för nordisk filologi 113:29-57. 39) 1998c. "Oðinnn's Vision", Maal og Minne 11-19. Lotte Motz's family left Austria in 1941, following the Anschluss. She earned her B.A. from Hunter College and pursued her graduate studies at Stanford University and the University of Wisconsin, obtaining a Ph.D. in German and phi logy from the latter institution in 1955. She later earned a BPhil at the University of Oxford in Old English. Motz obtained an academic position in the German language department at Brooklyn College as well as a teacher at Hunter College. 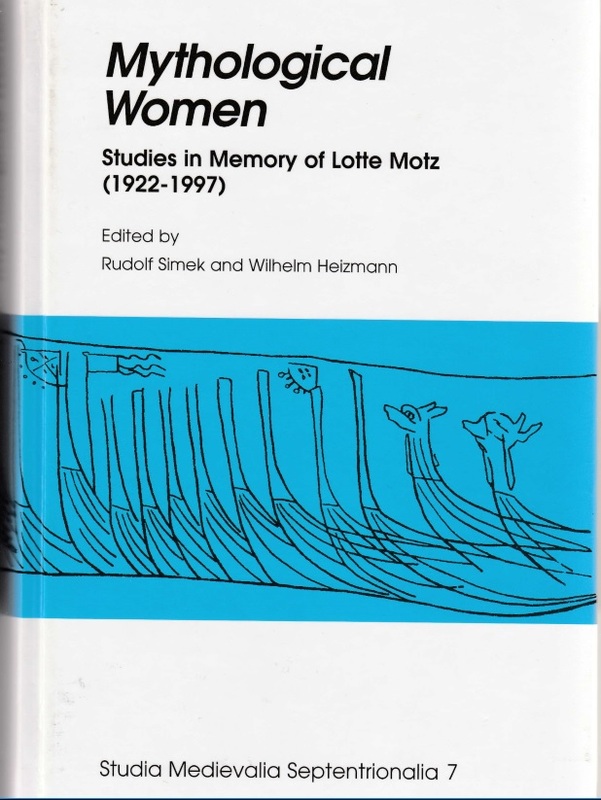 Motz retired from teaching due to illness in 1984, her research interests came to focus on female figures in Germanic mythology, especially the nature and function of giantesses.